The value of a International Hydrological Decade, 1965-1974 - 5 cents 1968 stamp depends on several factors such as quality and wear, supply and demand, rarity, finish and more. Values in the section are based on the market, trends, auctions and recognized books, publications and catalogs. This section also includes information on errors and varieties and characteristics. The growing need for solutions to problems involved in the optimum use of water resources is accented by the Canada Post Office International Hydrological Decade Stamp. Hydrology is defined as a scientific field which covers the entire history of the cycle of water on earth. It refers to the circulation of water from the oceans, through the atmosphere, back to the oceans, or to the land and thence to the oceans by overland or subterranean routes. Included in this science is a study of effects on man and the effects of man's activities on water. The IHD programme extending from 1965 to 1974 was a cooperative international study sponsored and co-ordinated by UNESCO. Canada was one of 97 member states whose purpose was not only to increase knowledge in the developed countries but to increase the ability of the underdeveloped countries to gain knowledge of their own water resources. 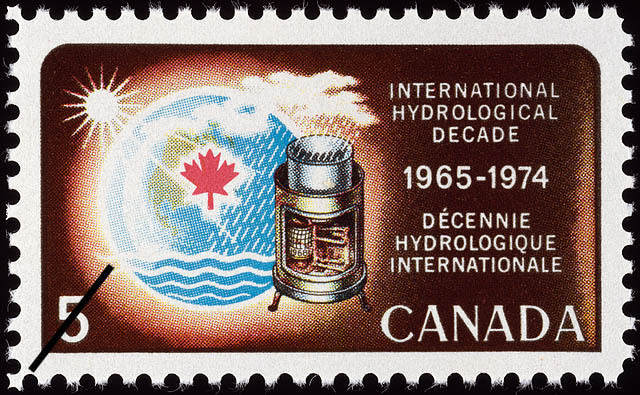 The International Hydrological Decade stamp marks the second occasion in 1968 that the Canada Post Office has introduced a newcomer in the field of Canadian stamp design. The chosen rendition was executed by Hungarian born, Canadian by adoption, Prof. Imre von Mosdossy. He has to his credit hundreds of stamps chosen for use by postal administrations in many parts of the world. His designs for this project incorporates segments, of a symbol adopted by the Canadian National Committee, International Hydrological Decade. Centered in the design is a weighing rain gauge symbolizing instruments used during the 10 year international programme.